When attempting to find a sewing machine to fit your needs, it can be difficult. You may be a beginner and unsure of what to look for, or you might be an experienced sewer who wants the most bang for your buck. 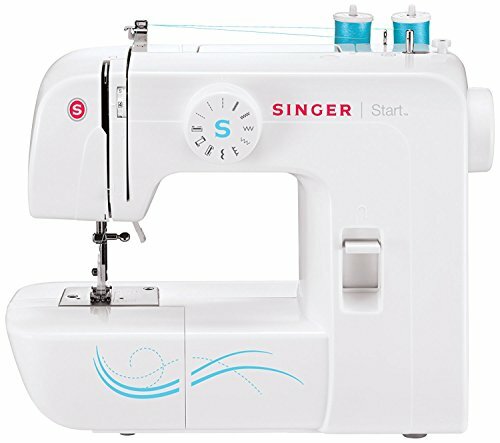 The Singer 1304 is a cost effective way to experiment with sewing, and it includes numerous accessories for the price. Some may find it difficult to use, but its many features outweigh any negative aspects. 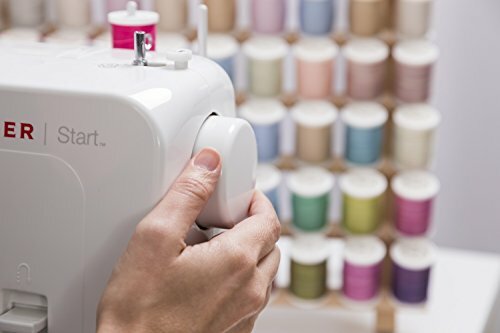 The 1304 has abundant features that will introduce a newcomer to hobby sewing, and it can keep the most experienced sewing enthusiasts entertained and make their projects easier. The machine offers a quick threading option, allowing users to begin a project without a lot of preparation, if the diagram on the machine is followed properly. In addition, the machine’s knob allows you to switch between six built-in stitches. These stitches are clearly labeled, easy to use, and the built-in stitches are stitch patterns that will be used often. The machine’s dual spool pins will allow your artistic ability to come out. You can sew parallel rows of stitches, even in different colors. You’ll be able to easily add a creative touch to a project or hem clothing with this useful feature. You’ll have tools for any type of sewing. The removable free arm on the Singer 1304 will give you easy access to difficult parts of clothing, like pant hems, cuffs, and collars. The machine’s three presser feet can easily be put on or removed, and this will give you the ability to easily add button holes, zippers, or simply sew cloth together. 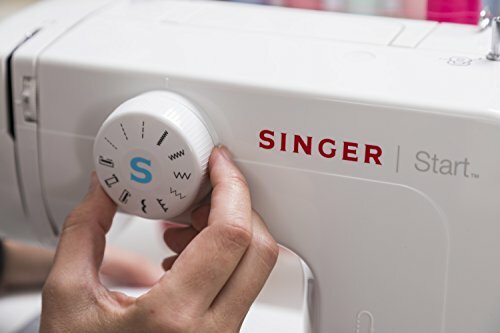 The Singer has quite a few automatic features to save you time -- like automatic tensioning, automatic 4-step buttonhole, and automatic bobbin winding system. These features allow you to skip complicated and tedious tasks by allowing the machine to perform them for you. The instructions for the features are clearly stated in the manual or printed on the machine’s exterior. The Singer 1304 sewing machine is small and lightweight, coming in at only 13 pounds. This makes it a machine that is easy to move, and it’s the perfect machine for traveling and creating on-the-go projects. In addition, the size makes it ideal to use in small work areas or store in tight spaces. Despite its size and weight, the machine is extremely durable. The machine’s smooth, white exterior conceals its heavy-duty and sturdy frame. It can easily be used for thick materials like card stock or heavy fleece, and it won't skip a beat. One of the best things about the 1304 is its limited warranty. This warranty will ensure your machine is repaired, at little or not cost to you, if there is a factory defect. Whether or not there is a cost is dependent on the part that needs to be replaced and the age of the machine. There is no cost if it needs to be repaired due to a defect within the first year. Every subsequent year, labor is charged until the warranty expires on the part in question. The sewing machine head is under warranty for the total 25 years. We know that things happen, and this warranty will give you peace of mind and keep you sewing for a long time. When opening the Singer’s box for the first time, you may be surprised at the amount of accessories included with the sewing machine. 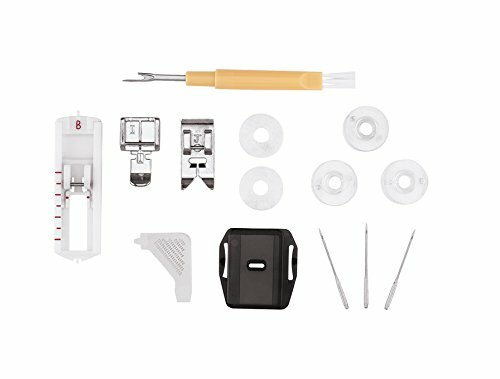 Singer provides a variety of accessories for the beginner as well as advanced sewing enthusiasts. All accessories are kept out of the way and stored in the free arm accessory storage tray. While the machine’s speed knob allows a user to adjust the sewing speeds, the foot pedal is the only way to control the machine’s needle. This will make it difficult for some to use successfully, as the machine's 750 stitches per minute is quite fast. It may take time for you to become accustomed to the speed. The bobbin of the machine can jam easily if you’re not careful, and it can be difficult to find the problem. The owner’s manual doesn’t provide adequate instructions to unjam the machine in some cases. One of the most common jams occurs when thread from the automatic bobbin winding system becomes tangled in the interior gears. The majority of the jams are simple to fix, but users may be frustrated by having to disassemble and reassemble the machine during a project. Being proactive is the only way to avoid a jam before it happens, and sometimes this is impossible. While the 1304’s many accessories and features are great for experienced sewers, they may make the machine difficult for beginners. This is further complicated by the lack of instructions included. An instruction manual does accompany the machine, but it’s not complete enough for beginners. Children may specifically find the machine difficult to operate. The Singer 1304 is a great machine for those who are new to sewing or for those who are on a budget. The many features and accessories make it a sewing machine that can be enjoyed by anyone. Its small size and sturdy interior frame is perfect for travel, and its limited warranty will cover defects for many years. Despite the many diagrams provided on the machine’s exterior, it may be difficult for some to use, specifically children. It would be beneficial for beginners to research information about the machine in addition to reading the instruction manual because the manual is very brief. The machine jams easily, and it can be tedious to disassemble the machine to fix the problem.